One aspect of living unplugged from a suburban existence is that we are - literally - unplugged. 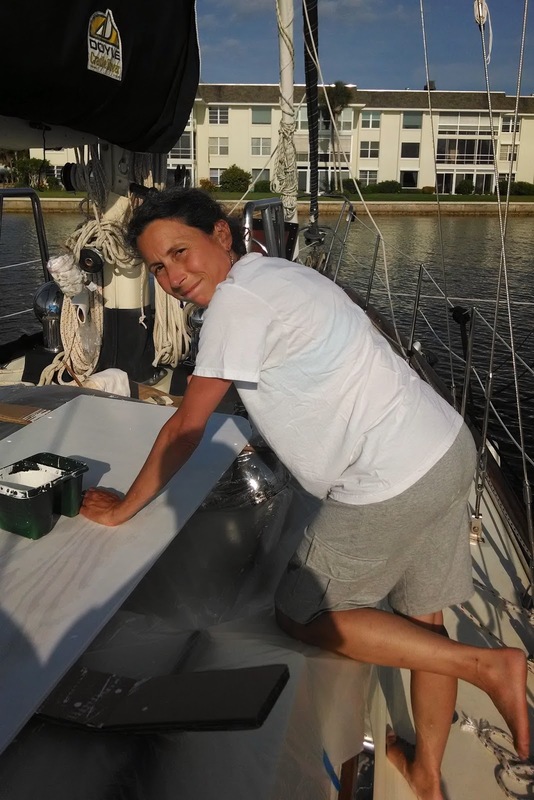 The ready access to utilities, mostly taken for granted in our former situation, must be directly addressed now that we are living on a boat. Water, electricity, internet access, sewage and garbage disposal – all must be obtained or dealt with by us directly, and constantly monitored. Our recent extended stay in Vero Beach focused on assessing and beefing up our power situation. 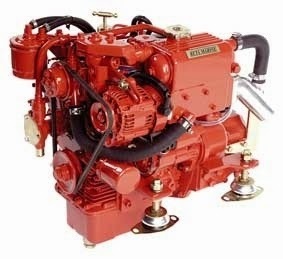 Any boat with a diesel or gasoline motor has a starting battery just like a car. 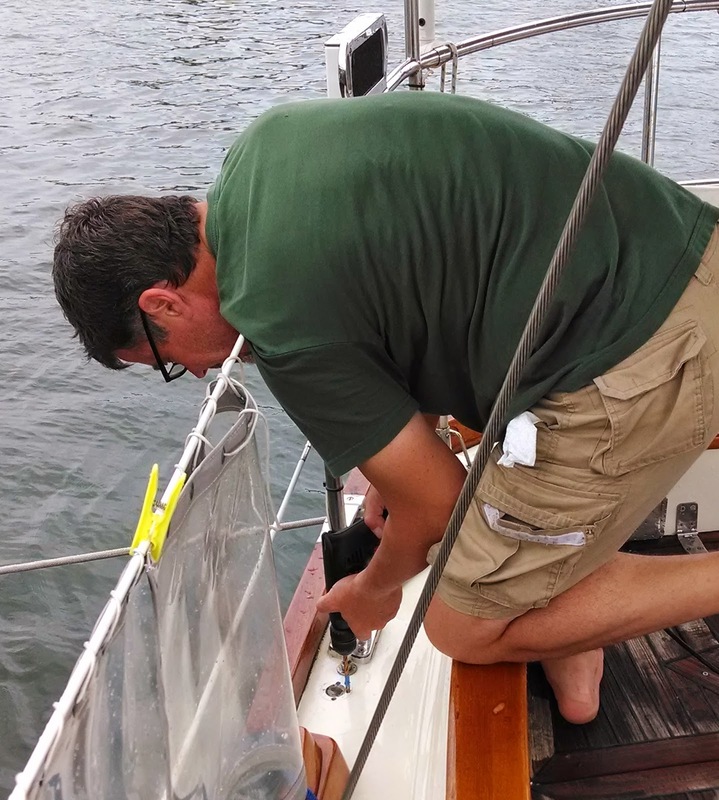 But unlike cars, most cruising boats also have a separate bank of "house" batteries that run lights, water pressure, electronics - pretty much everything besides starting the motor. (The starting battery is kept separate so that it will always be full and able to start the motor.) Naturally, the house batteries are drawn down by daily use, so the two concerns are: how can we use less power and how can we replace the power that we do use. 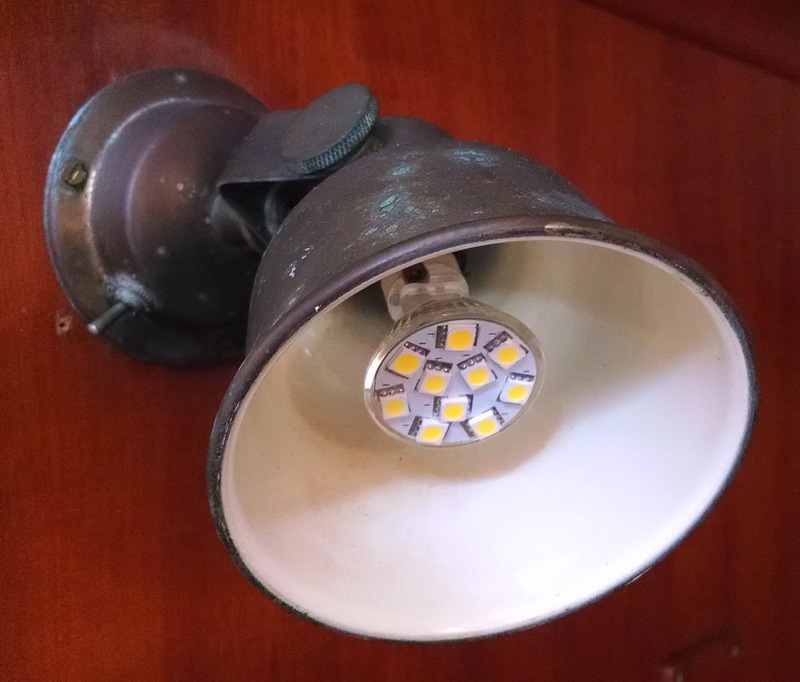 On the conservation side, one thing we have done is to replace all our interior and running lights with LED bulbs, which draw significantly fewer amps than incandescent bulbs. (Running lights are external lights shown while under way at night). For example, the bulb of a single running light will draw 25 watts if incandescent while its LED replacement draws only 1.5 watts. There are at least three running lights, so this is a significant savings. Another step we've taken to reduce power use setting our refrigerator/freezer so that it's all refrigerator. 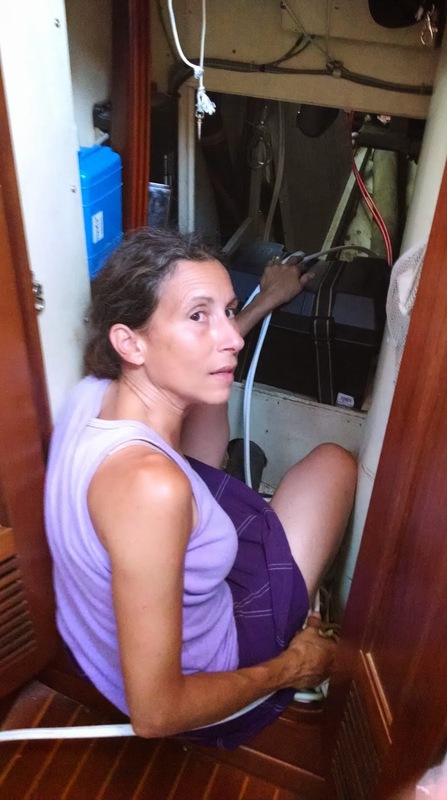 The fridge runs on DC, so there's no inverter penalty, but it is still the biggest power consumer on the boat. 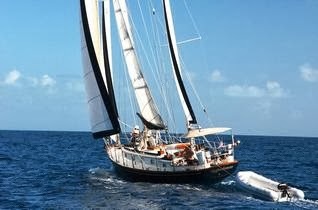 This is typical for most cruising boats. The main way we could improve this would be to tear apart the unit and add more insulation. Needless to say, this will not happen soon. There are a number of options for charging batteries. 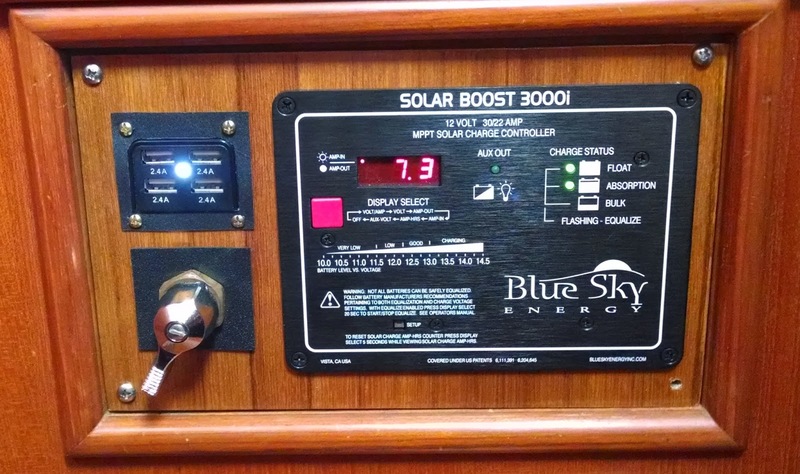 Some boats come equipped with an on-board generator. These are usually diesel-powered and not only charge the batteries but provide AC as well. The downside is that these are expensive and purchase and storage of the fuel required to run them. They can also heat up the boat's interior, and they can be loud. Their benefit is that they will charge batteries on demand in any conditions and are installed out of the way within the interior. Other boats use portable generators. These are small units that are stored on deck and are most often gasoline-powered. 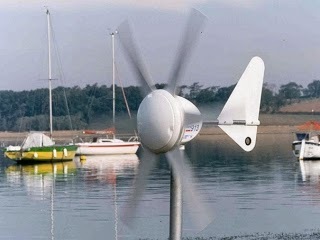 These are the cheapest solution, and they do a good job generating power. The downside is that all the gasoline to run it must be stored in jugs on deck. (Gasoline is explosive, and it is generally a no-no to store it below deck). And while new portable generators are fairly quiet, some don't like even that level of noise in a peaceful anchorage. solar and wind. 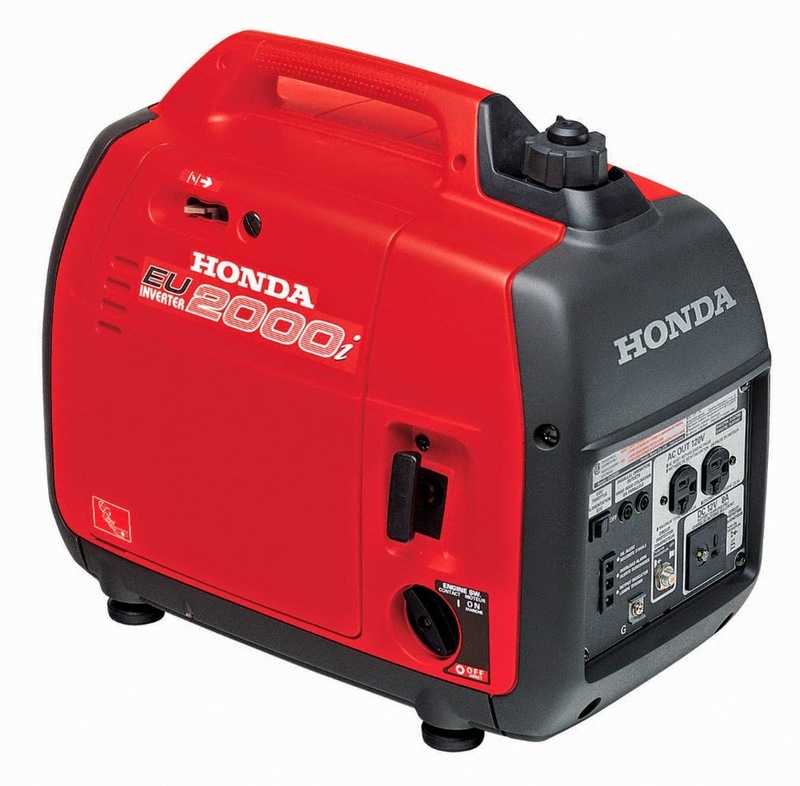 Both options are more expensive than a portable generator, and installation can be fairly difficult. 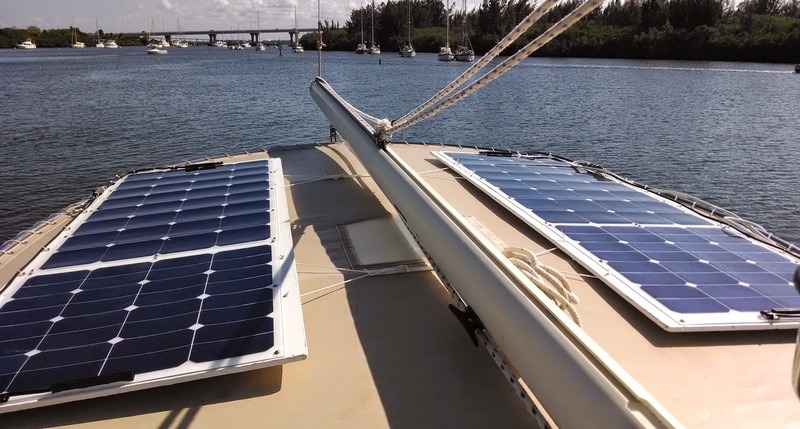 Each needs to be mounted on a structure than can withstand high winds and salt-water, and wiring must lead from their exterior position through the deck to a controller that connects to the batteries by its own wiring. The choice for solar versus wind is often a function of where one will travel since sun and wind conditions will vary accordingly. Wind generators can be noisy as their blades chop through the air, and solar panels can often take up a large amount of space. However, both are beautifully passive and will charge the batteries with no involvement by the boat owner! Daystar’s on-board generator was on its last legs when we bought her (it was 25 years old), and it is no longer with us (literally). We considered using our main engine to charge the batteries, but determined that the new Yanmar’s alternator just wasn’t getting them full enough. 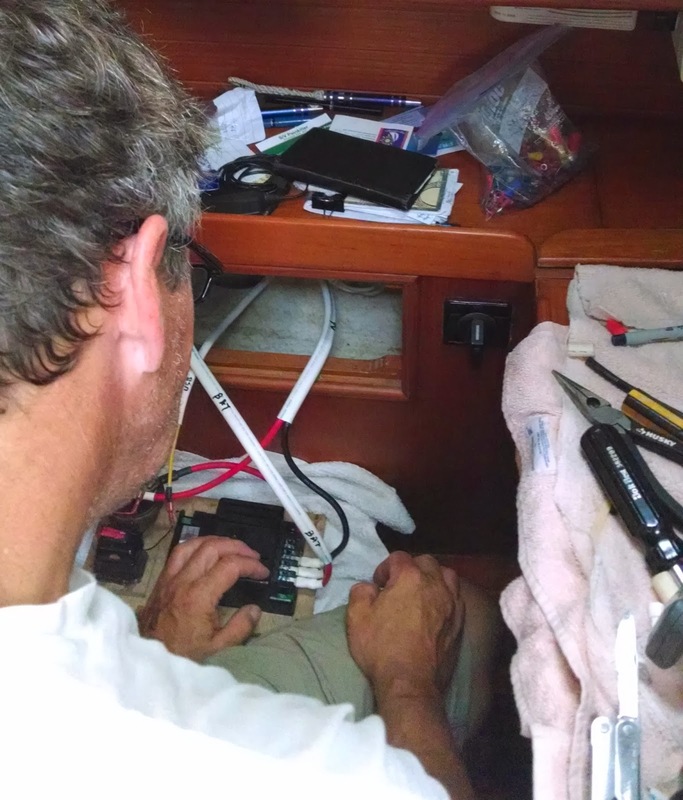 We found a great electrician -- Mike Giannotti from the Hartge's Yard in Galesville, MD who gave us advice on our power options and also straightened out some other serious electrical problems. (Mike summers in Galesville and winters in Vero Beach) Lots of research later, we settled on the solution of solar panels. 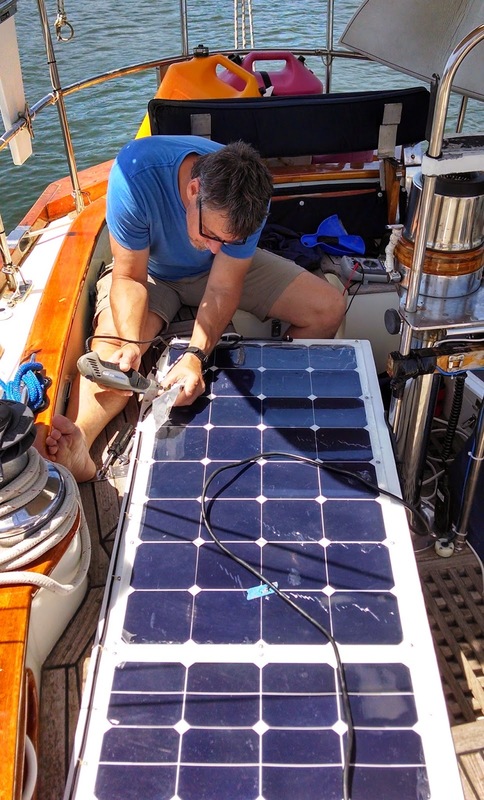 That prompted a new round of research to determine what type of panels were best for us, which brand to buy, and – most difficult – how to mount them. We settled on two 100-amp and two 50-amp flexible panels from Grape Solar in Eugene, OR. These were very competitively priced panels, and considering that Grape sells panels to CostCo, Walmart, and HomeDepot among others, they have incredible customer service. Their tech support guy gave us his mobile number with instructions to call him any time during the weekend if we had any questions. And one panel wasn't working quite as well as it should, so Grape overnighted another to us in Florida from Oregon. 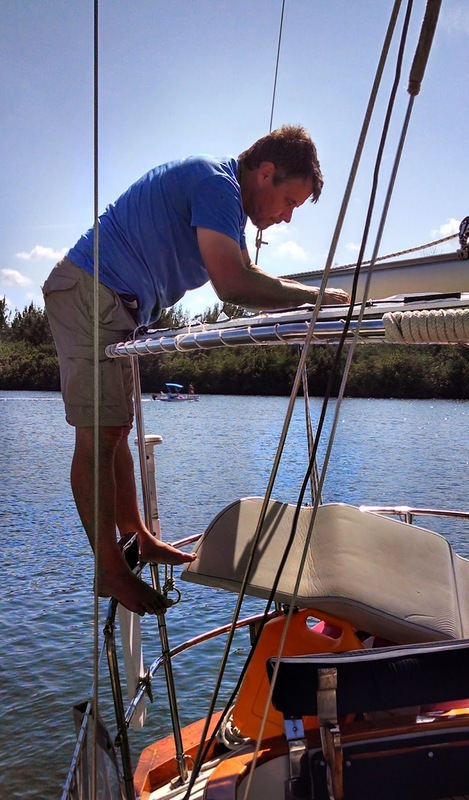 Orchestrating the mounting and installation was quite a feat, but we finally came up with a way to mount them on our bimini top. Like everything else, this required a custom job with lots of parts made by hand. though that they were too flexible for our installation and needed a more rigid backing. Greg and I cut, painted, and mounted them on 3/8"marine plywood, which we then secured to the rigid bimini (an awning over the cockpit).. Greg puzzled out the wiring requirements to connect them to each other and to the Blue Sky controller. 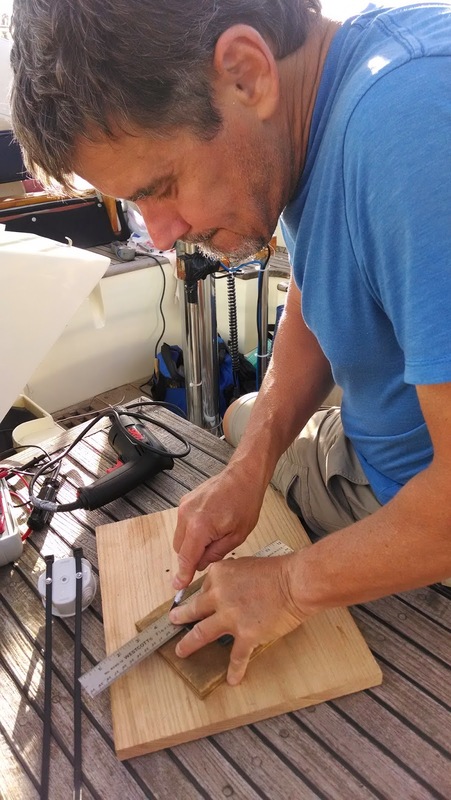 I snaked the wiring through the innards of the boat to connect it all, while Greg created a beautiful control panel to house the controller interface, the panel power switch, and a DC charging-port for our phones. This likely doesn’t sound nearly as complicated as it was, and it took us a few weeks to complete. The result is fantastic. It’s a wonderful feeling to be relaxing in the quiet of the cockpit, knowing that our panels are pumping out amps without our lifting a finger. Even on partly cloudy days we will generate 70-90 Ah, and on sunny days we have generated as much as 130Ah. It is still a challenge to keep our power consumption within limits, and we need to monitor our battery levels at all times. But we are so pleased that we now have the capability to produce power easily, quietly, and with no additional cost or care.